I'm always on the hunt for new ways to listen to podcasts and Google Chromecast is my new podcast listening device. For those of you who don't already know, Chromecast is dongle that you can purchase from the Google Play store or places like Amazon, that connects to the HDMI port on your TV. This device fits in the palm of your hand and runs for about $35 on Amazon. Here's my affiliate link if you're interested in purchasing one. With the Chromecast app installed on my phone I can use the nicer stereo system on my SmartTV to listen while I am doing other tasks like cooking or cleaning. This comes in really handy when I don't want to be bothered with using my ear buds and I want more control of the volume of my favorite podcasts. Previously I talked about how I sync my iTunes library to Google Play and you'll see in the video that is what really makes this option possible. 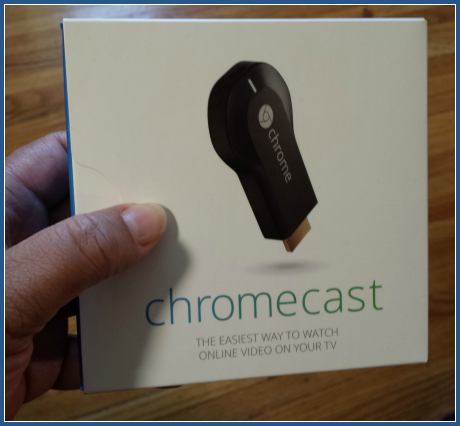 But What if You Have an Older TV, Will Chromecast Still Work? In the video I am connecting Chromecast to a newer model television and using the dongle via HDMI and USB. However, if you have an older model TV that doesn't have a USB port, Chromecast includes an alternative connection method for plugging into a regular electrical outlet. Now if your TV is so old that you don't have a HDMI port, that I highly recommend you think about upgrading to a Samsung SmartTV. More Apps for Chromecast Are Coming Soon! Have you tried Google's new Chromecast yet? Let me know what your experience with it has been so far. 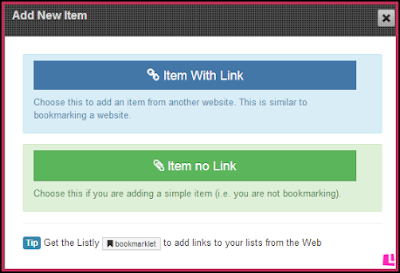 List.ly is a content curation tool that is simple to use and share on the web. Here's a list of Top Podcasting Resources that I started to collect, but I need your help to make this list complete! Simply set up an account with List.ly, visit the Top Podcasting Resources list and click the add button to add a resource to the list. You can also give a rating to the items on the list by giving each one an up vote or a down vote. 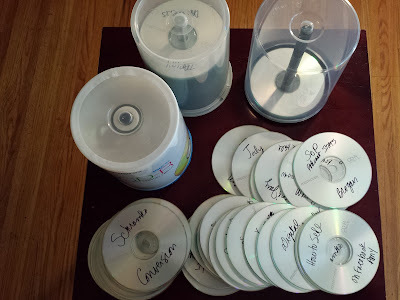 I started the list off by adding a few of the podcasting collections that I started curating in the last few years including my Scoop.it topic and Pinterest board. I got the inspiration for this list from the fantastic members of the Podcasting Resources and Technology Community on Google+. This group is extremely helpful and many of the members have a long history in podcasting and internet broadcasting. Being a member of this community demonstrates how important it is to network and collaborate with your peers and connect to thought leaders in your industry. Just to be clear about what is appropriate for this List.ly, it is not intended to list individual blog posts or podcasts. There is a different List.ly for that purpose which you find here. 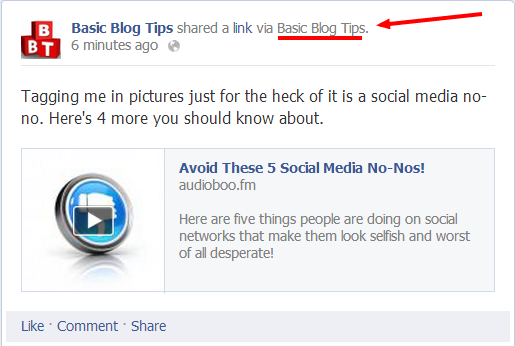 As you can see below, List.ly is easy to embed on your blog but it is truly a work in progress. 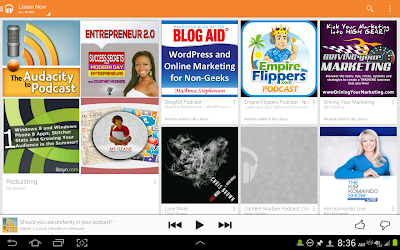 Do you have any podcasting resources you would like to add to the list? Head over to List.ly and look for the Add to List button at the top right. Then you will see the pop-up for Add New Item. After I approve the item it will appear on the List.ly. I'm looking forward to your contributions and I'm sure you'll find some new podcasting resources to explore. Is James Schramko Taking Over the World of Podcasting? 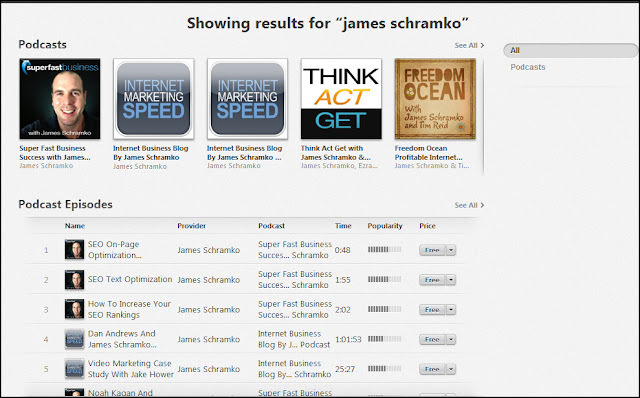 I first heard about James Schramko a few years back from seeing his Facebook ads for Traffic Grab. This was a video course that I thought was quite professional and I remember learning a ton from it. It helps when you make a good first impression like that on someone and I hope I leave people with that same kind of impression when they run across my blogs and tutorials online. I'd almost forgotten about "Jimmy", as his friend and Freedom Ocean co-host Tim Reid often refers to him, (more about Tim Reid later) until I heard him being interviewed on one of my favorite podcasts. At this time it's difficult to say which podcast I heard the interview on because he has appeared on just about everyone of my favorites. Schramko is currently doing his own solo podcast Super Fast Business but he is also a cohost on two other popular podcast! Freedom Ocean with Tim Reid is my favorite out of all these podcasts but I must admit that I enjoy them all. The premise of Freedom Ocean is that "James makes millions from Internet Marketing. Tim's got millions of questions". This format appeals to me mainly because Tim is easy to relate to since he deals with a lot of bricks and mortar businesses and he is learning from James while at the same time sharing insights to James from what it's like on the other side of business. You really need to listen in on this podcast to see exactly the type of chemistry that these two chaps have between them and I think that Tim is someone we can all relate to. Once you subscribe to this show you'll find yourself listening to certain episodes over and over again without getting bored. In fact you might either end up in stitches or sitting with a pen and notepad wishing it were an ebook or something. That's why I stuck his solo podcast Small Business Big Marketing down at the bottom of that playlist widget above. By the way, you can put away the notepad and pen because if you sign up for the Freedom Ocean mailing list you can get the pdf's of the full transcripts of each episode. Think Act Get with Ezra Firestone has a different flavor to it. Ezra comes from the world of ecommerce however it is a subject that he and James rarely discuss on the show. Most of the content relates to mindset and how to develop a good (or even better) attitude for business. I see this more as a personal development podcast so if that is your thing, be sure to tune in. The show is quickly becoming a top rated podcast and I suspect it will hit the new and notable section many times this year in the U.S. market (if it hasn't already). Super Fast Business is James's solo effort. This show is a mix of interviews, news updates and listener feedback episodes. I think most of the episodes (if not all) are also available on YouTube, so if you like to consume content via video this is the show for you. I listen to it as a podcast and I love it that way because the episodes are often under 5 minutes. This makes them very handy to use as filler content when I burn CD's for playback in the car or on an old Bose CD player that I keep in my bedroom. The interview episodes are my favorites especially when he brings on my favorite guest, Clay Collins the co-founder of LeadPlayer. Clay Collins even has his own podcast now too called The Marketing Show and I'm sure that James has inspired him to start podcasting just as he has inspired so many others including my buddy Jake Hower of the Multimedia Marketing Show, just to name a few. By now I think you can agree that James Schramko is taking over podcasting by dominating on iTunes with all of his weekly podcasts, interviews and guest appearances all over the place. If you have a business and you haven't tuned in yet, be sure you do. If you are an avid listener like me, please let me know which one of these shows is your favorite? 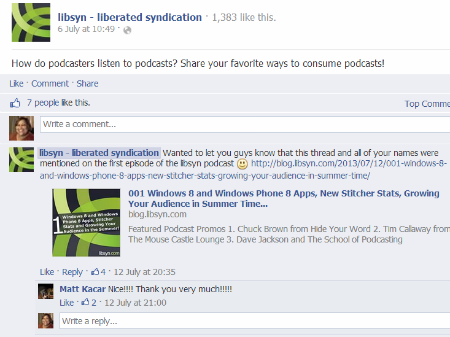 Libsyn, short for Liberated Syndication, is one of the most popular podcast hosting services around. Recently they redesigned the front end of the Libsyn website and updated their logo. I think the new logo looks great, don't you? 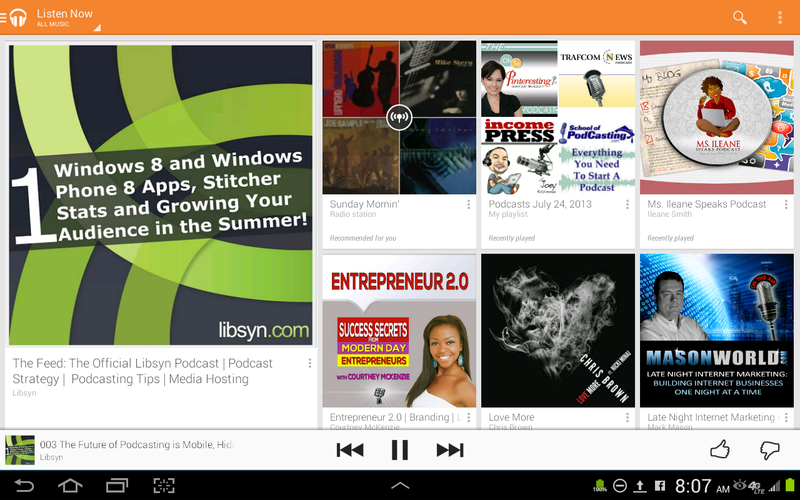 I switched my podcast feed for iTunes from Audioboo.fm to Libsyn back in October of 2012. I decided to use Libsyn as my podcast host after listening to an episode of Ray's podcast when he interviewed Rob Walch from Libsyn and they talked about the stats dashboard. The other featured that appealed to me about Libsyn hosting is the OnPublish feature with Blogger. In case you don't know, I am using Google's Blogger platform for The Ms. Ileane Speaks Podcast so I was really pleased to hear that Libsyn is integrated with Blogger. Most bloggers who use self-hosted WordPress (wrongly) assume that they can host the media files for their podcast with their blog host. However that is not a great idea, you need to get additional webhosting, because when you end up getting more traffic as your audience begins to grow your blog host might shut your blog down. I found out years ago from listening professional podcasters like Dave Jackson from School of Podcasting and Ray Ortega from The Podcasters Studio that it's best to obtain separate web hosting for your media files. That applies to both audio and video podcasts. There is one thing I didn't like about using Blogger for the podcast. 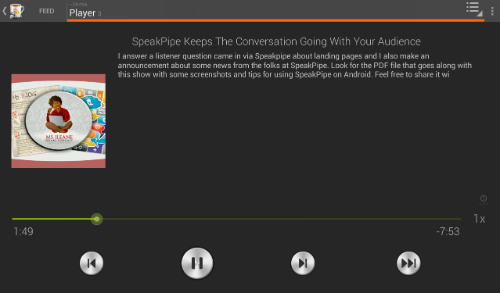 The default podcast player that Libsyn uses with their OnPublish integration isn't very attractive. I ended up finding a way to make the player more attractive and engaging and I recorded this tutorial for it. 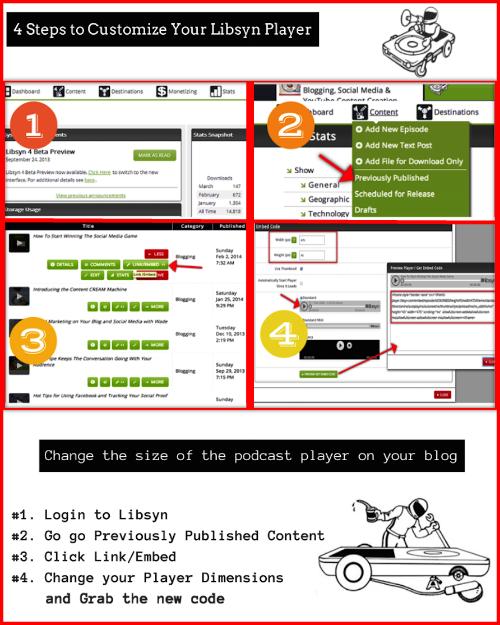 Let me know what you think of using Libsyn for your podcast webhosting and if you changed the podcast player on your blog. For years podcasters, musicians and audio technicians have relied on Audacity to edit their audio files. Typically you can download the open source software from SoundForge.net and it is available for PC and Mac. The other day I was browsing the Google Chrome Web Store and I was pleasantly surprised to see that Audacity is available as an extension for Chrome. UPDATE: THIS EXTENSION STOPPED WORKING!! This extension is brought to us by Roozz and they have some other applications you might was to download. Visit their site for the complete list. Will you install the Audacity extension? Let me know if you want to learn more about how to use Audacity. You can find more podcasting news on my Scoop.it magazine for Podcasting.